After Windows, Mac and Linux users got to enjoy six games for a pay-what-you-want price Humble Indie Bundle 9 Brings Six New Games For Windows, Mac & Linux Humble Indie Bundle 9 Brings Six New Games For Windows, Mac & Linux Humble Bundle, the pay-what-you-want cult favourite, is back with six DRM-free games for Windows, Mac and Linux, all of which come with a Steam key if you pay $1 or more. Read More earlier this month, it’s now time for Android users to rejoice. 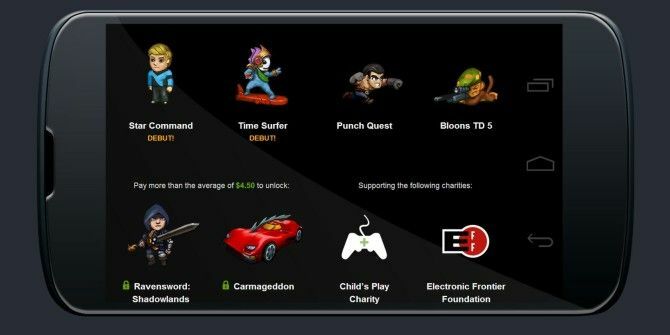 The Humble Mobile Bundle 2 has six games running on Android, including two titles that are making their debut: Star Command and Time Surfer. This is the second mobile-only game pack from Humble Bundle, although there have been several cross-platform game packs that included Android. As usual, it’s pay-what-you-want and the process gives the buyer the ability to distribute the wealth among charity, developers and a tip for the Humble guys. Star Command: A space adventure where you have to build tactical, science and engineering facilities on your simulation ship. Time Surfer: An infinite runner where you glide on a surfboard and collect space cake. In case you crash, you can fix your mistake by reversing time. Punch Quest: An arcade action platform game where you go on a quest and punch everything in sight. What’s not to love? Bloons TD5: The latest version of one of the most popular tower defense games in the Play Store is a “fun upgrade of primates, balloons and utter silliness”. Carmageddon: The original carnage game, where you have to kill all the pedestrians and destroy other cars in the most creative ways possible. Ravensword: Shadowlands: An action-adventure RPG where you go up against grotesque trolls and prehistoric dinosaurs. The Humble Mobile Bundle 2 is on till October 9.
is it just for android or can i play it one my iphone? I loved this game until it started crashing. Now at the end of each game, when I click continue the game crashes and needs to be restarted. It does save any progress you've made, but is getting to be annoying. I'm tempted to get this one.